Dramatically improve treatment for people with serious illnesses, including digestive disease, diabetes, and heart and vascular disease, while setting new standards for patient care, training, and clinical research. identify the child at risk for addiction and intervene early. Our physicians and scientists find new ways to attack the diseases that touch so many of us, and are always working on creating the next innovation—the next cure. Your gifts can fund the initial research that leads to world-changing medical breakthroughs. We’ve already done it with diabetes, celiac disease, immunology, transplant, and more. The University of Chicago fosters a collaborative culture where scholars across disciplines regularly work together to solve the most complex problems in medicine. For example, the Duchossois Family Institute comprises a multidisciplinary team of scientists, physicians, data analysts, and entrepreneurship specialists who work together to promote wellness through groundbreaking science on the immune system, genetics, the microbiome, and their shared environments. ...and goes to the patient's bedside. Just across the street from our research labs is a state-of-the-art hospital—the Center for Care and Discovery. 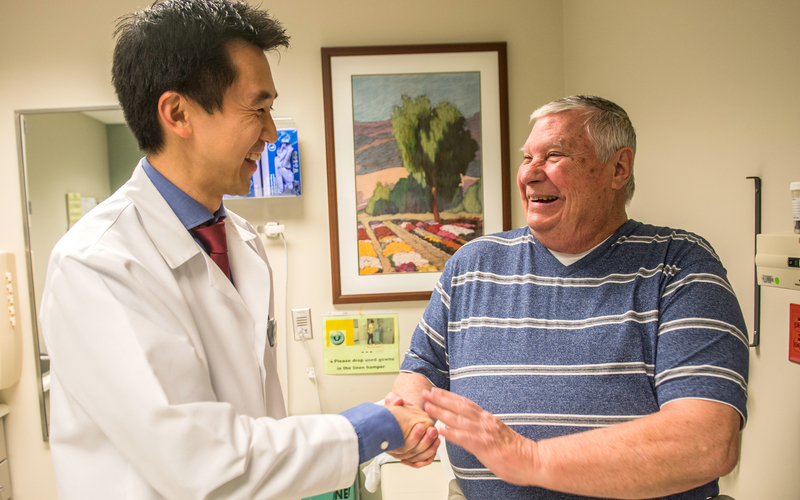 Every patient who walks through our doors receives compassionate care at the forefront of medicine. Our physicians quell ruthless cancers with reengineered human cells, and maneuver robots to perform surgeries that barely leave a mark. Plus, with our leading clinical trials program, our patients can access the latest, most-promising treatments. acquire new technologies essential to complex care delivery. Together, we can advance health. A grant from the Bright Promises Foundation allowed Comer Children's to train hospital doctors and staff how to provide care for childhood victims of trauma. Recognizing a need, the McNally family has given generously to establish the McNally Family Certified Diabetes Educator Program at Kovler Diabetes Center. At age 11, Allison Levine, AM'05, a pediatric social worker, was diagnosed with Crohn's disease, an inflammatory bowel disease that can be both painful and debilitating, and sometimes may lead to life-threatening complications.